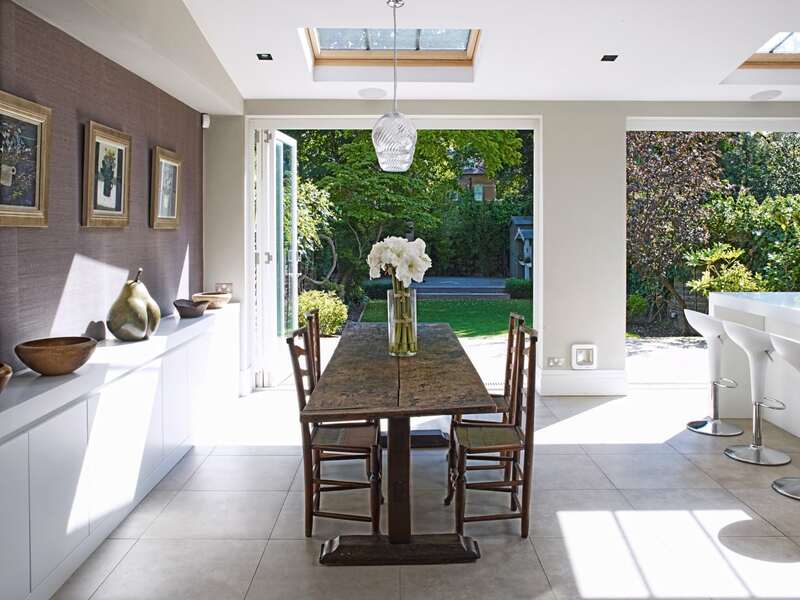 This fully glazed extension to the lower ground floor of this period property in a Richmond conservation area, provided additional living space and light, without detracting from the character of the house. 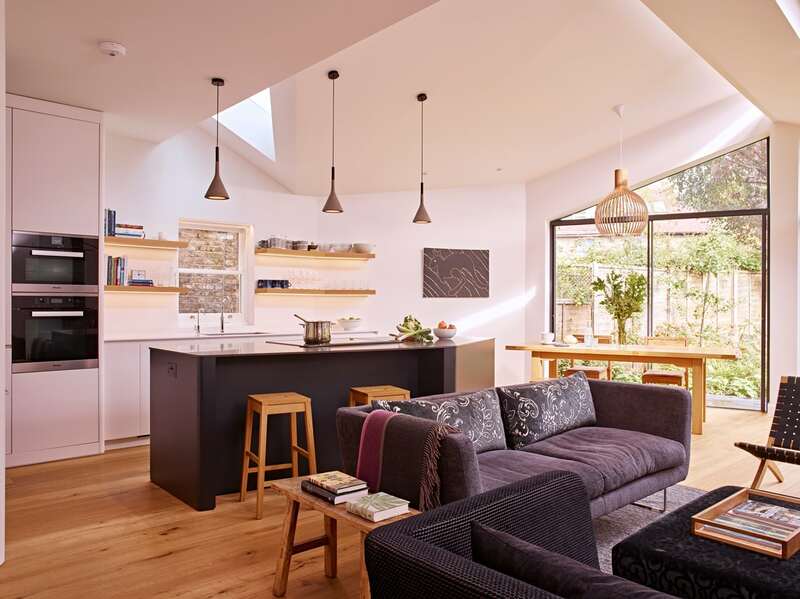 In addition to designing the extension, Kitchens by Holloways reconfigured the entire lower ground floor, removing internal walls to create an open plan kitchen, living and dining space. 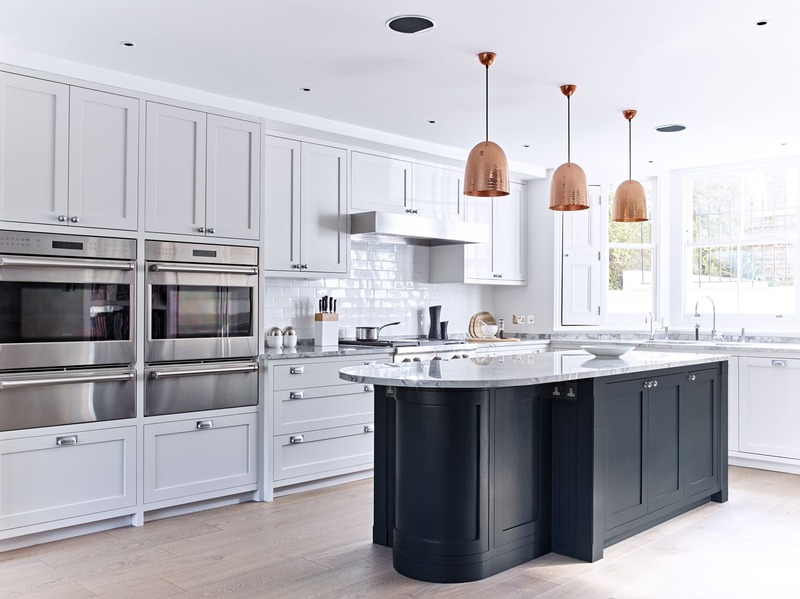 Kitchens by Holloways, take kitchen design seriously, and this kitchen is equipped for someone who enjoys cooking for others. 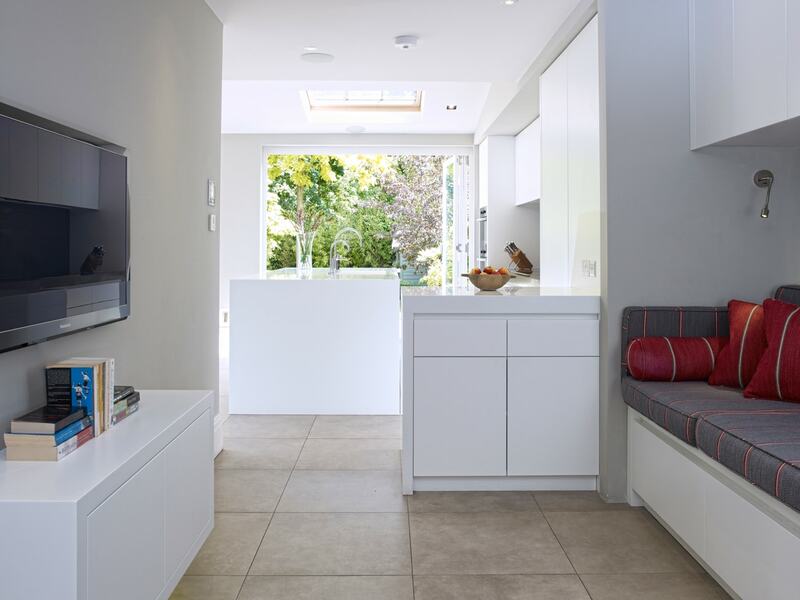 The layout includes a WC and utility room, neatly hidden away behind built-in joinery from our workshop in Shropshire. 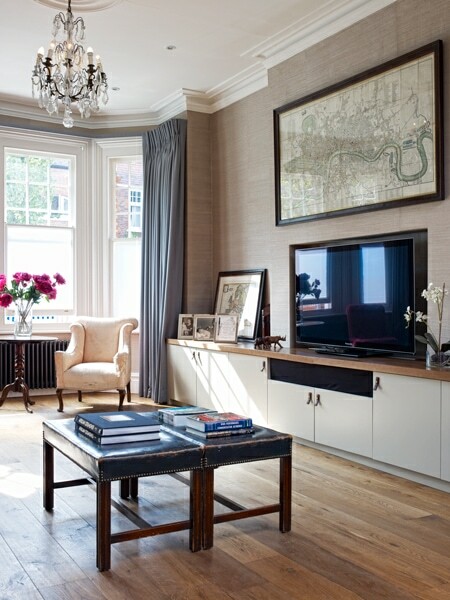 The style is contemporary, but the materials are authentic and warm. 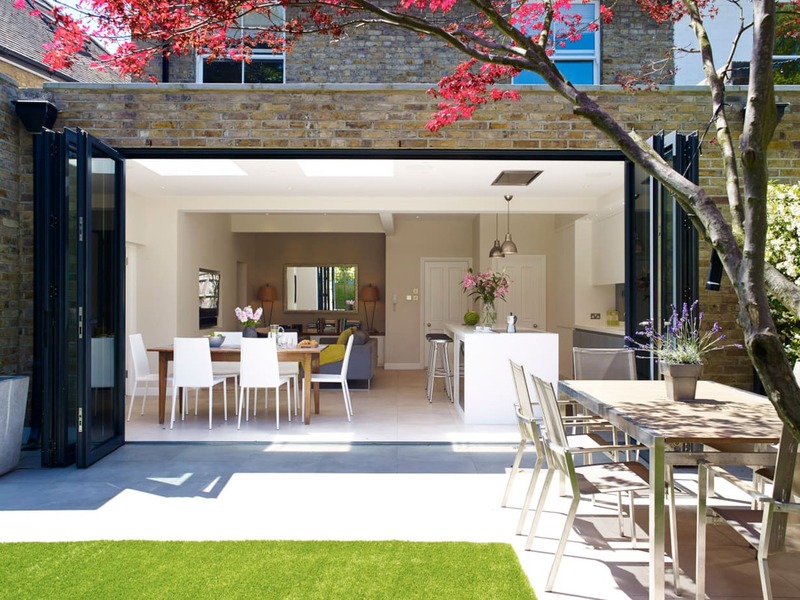 By combining the design for the exterior shell with the design of the interior, we achieve a very clean transition between the original house and the glass box extension. 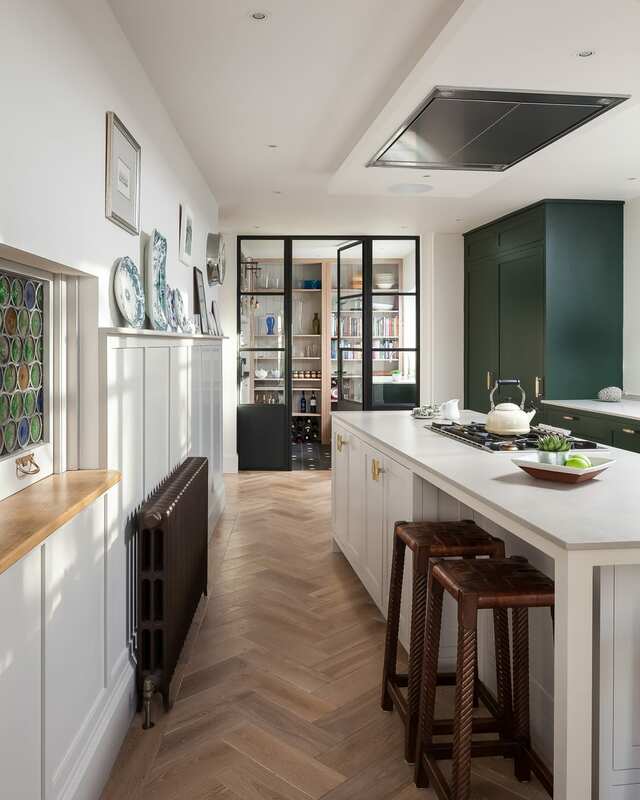 Kitchens by Holloways completely refurbished this listed Victorian terraced home, from the basement to the loft. 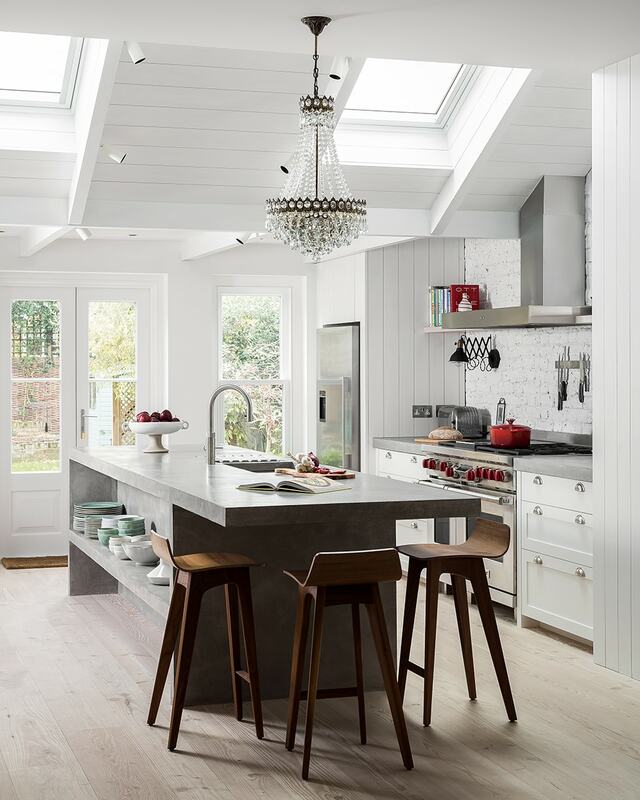 We started our design process in the kitchen using a combination of reclaimed furniture and new freestanding furniture made at our Shrewsbury workshop. 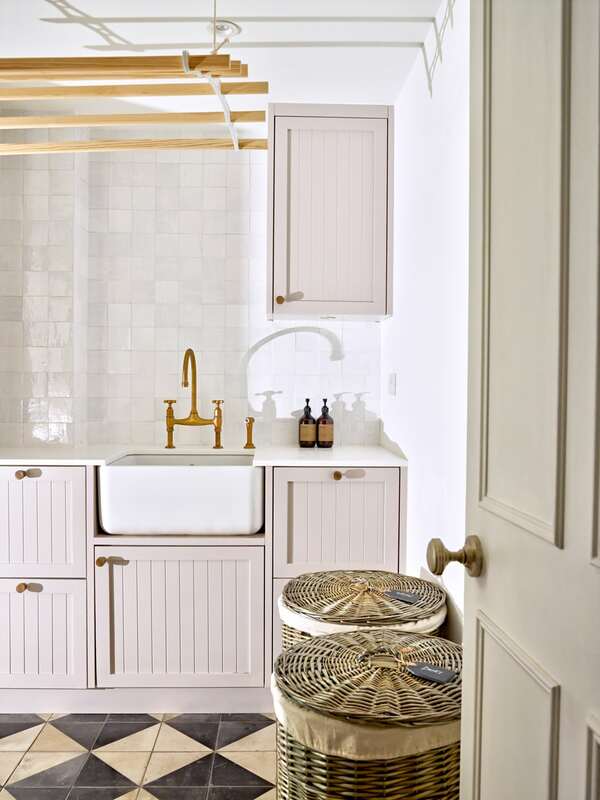 Banquette seating was made using a reclaimed bench from a London Pub, restored and adapted by our cabinet makers. 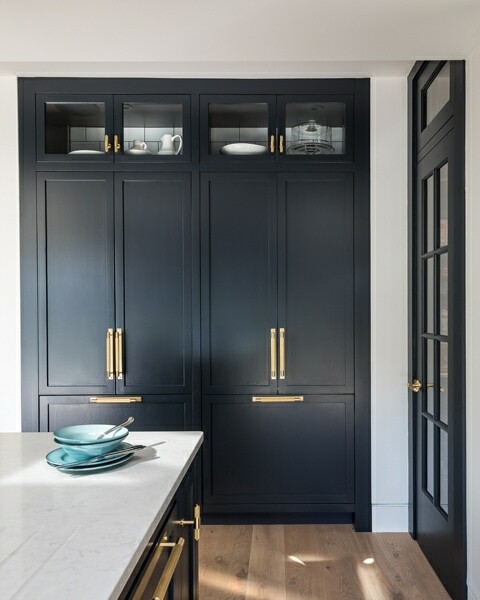 Bespoke cabinets were made to work around the quirky architectural details throughout the kitchen and other areas of the house. 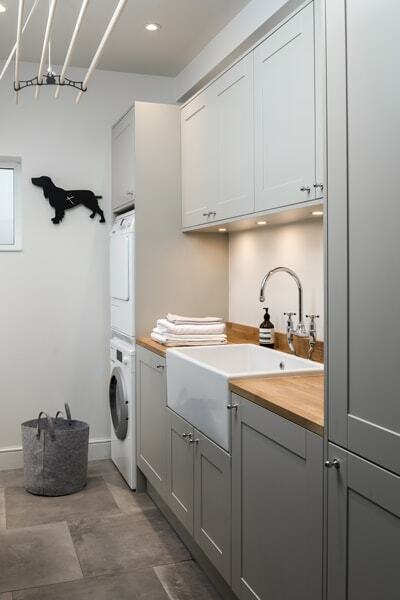 Renovations included a utility room, and boot room with built-in joinery designed and manufactured by Kitchens by Holloways. 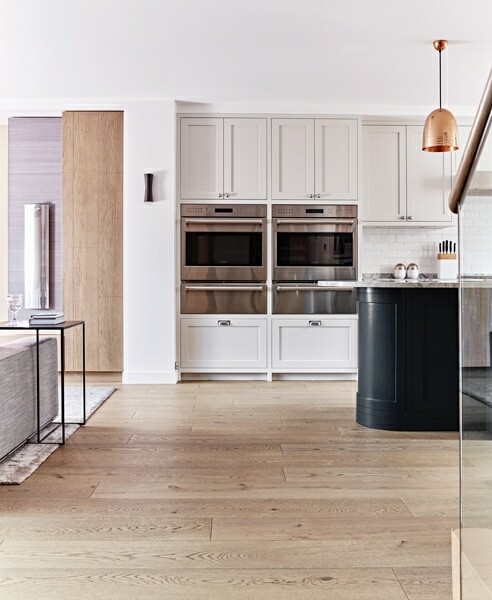 Floors and accessories in all rooms were selected by our in-house interior designer, Dabia Alani. 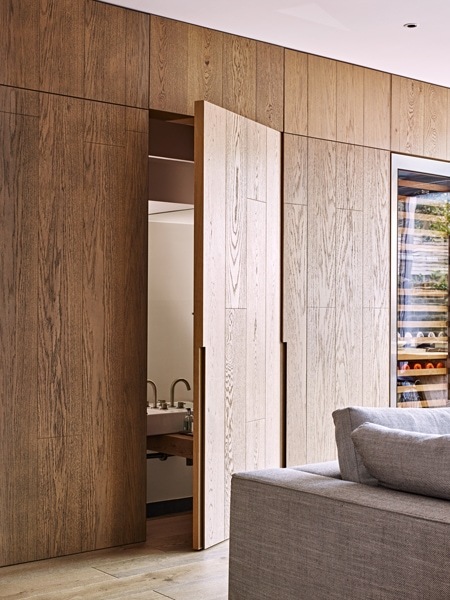 Internal Crittal doors were installed in the main living spaces, all designed and manufactured in-house. 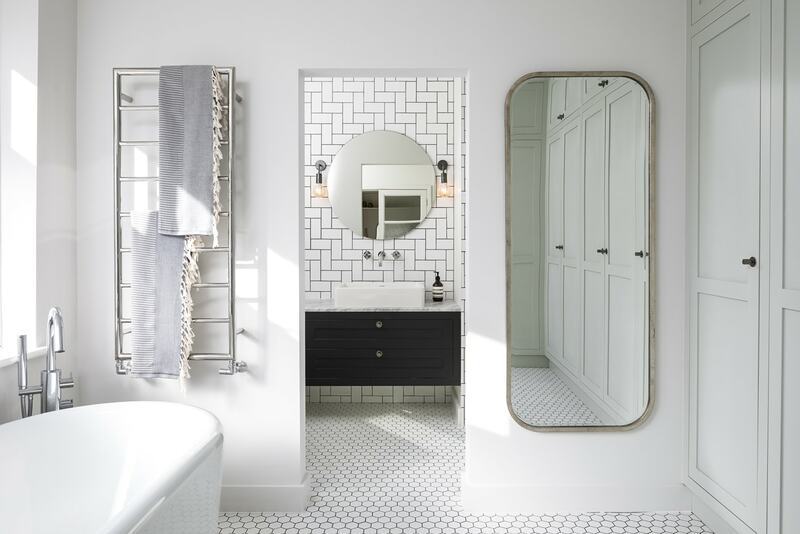 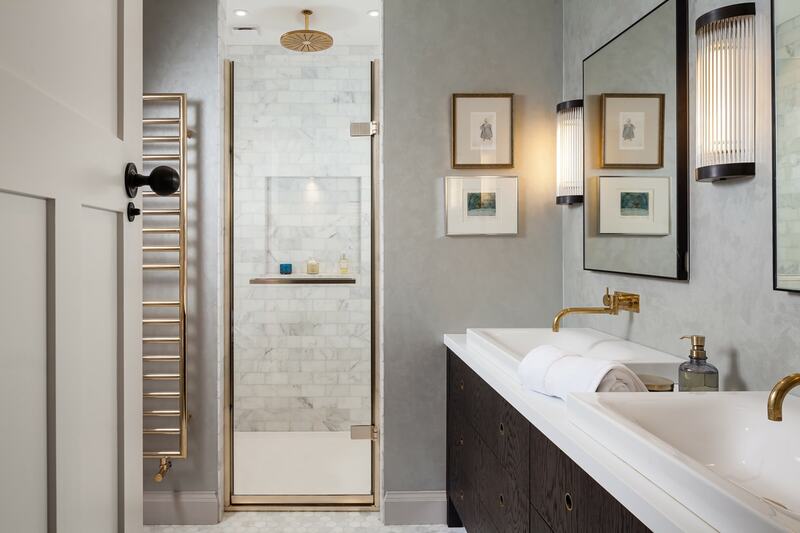 Kitchens by Holloways hold trade accounts with most of the major bathroom sanitaryware and brassware suppliers, and we are happy to design and install bathrooms as part of an extensive house refurbishment. 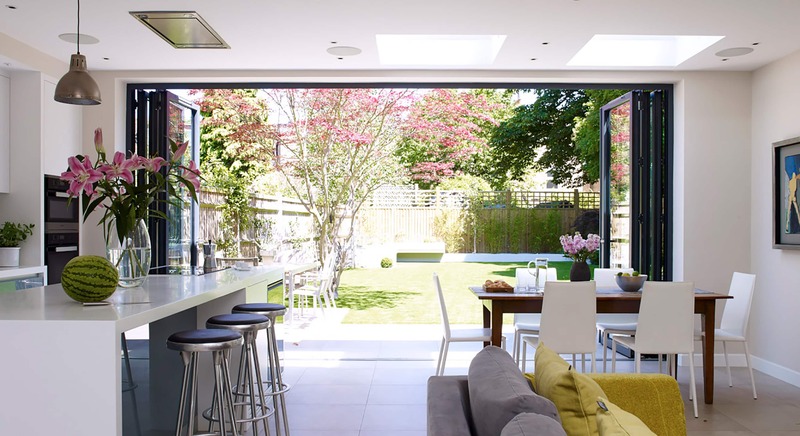 Kitchens by Holloways designed this rear extension to make the most of the light and the orientation of the Garden. 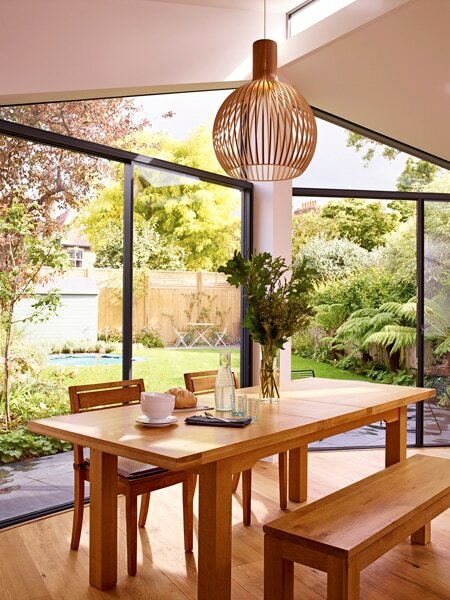 The slim profile, angled glazing created the perfect space for the breakfast table. 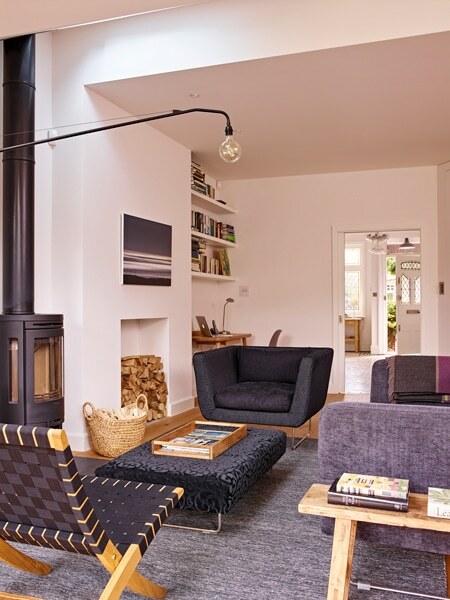 Whilst a wood burner provided a central focus for a cosy seating space. 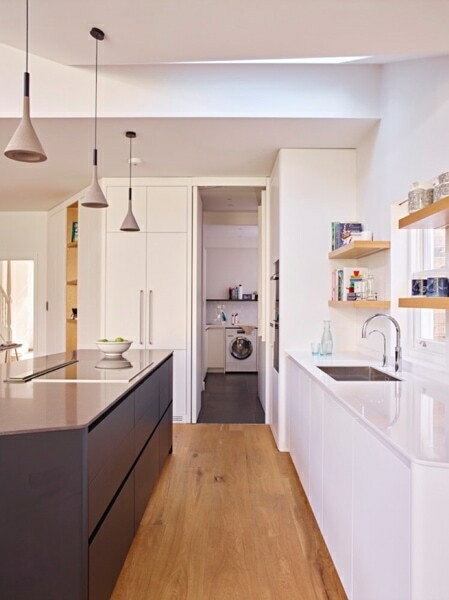 We created a huge walk in pantry and utility room at one end of the kitchen which enabled us to keep the kitchen cabinets in the main living space minimalist and understated. 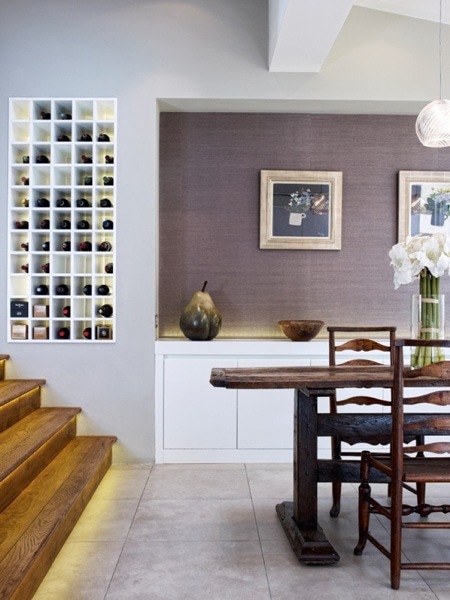 An eclectic mix of lighting helps to define each area of this kitchen, living and dining space. 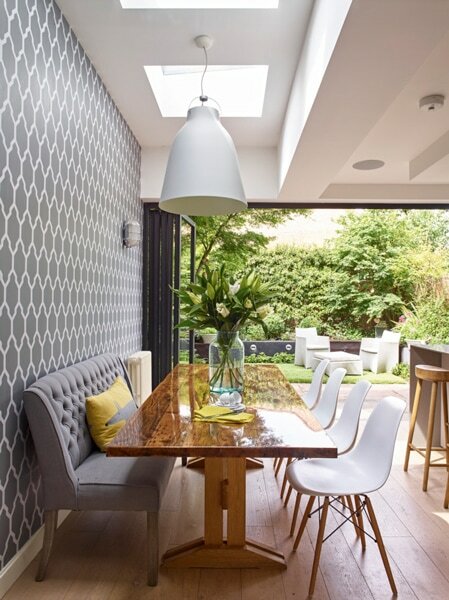 For this extension in a West London Conservation area, we aimed to create the feel of a New England beach house. 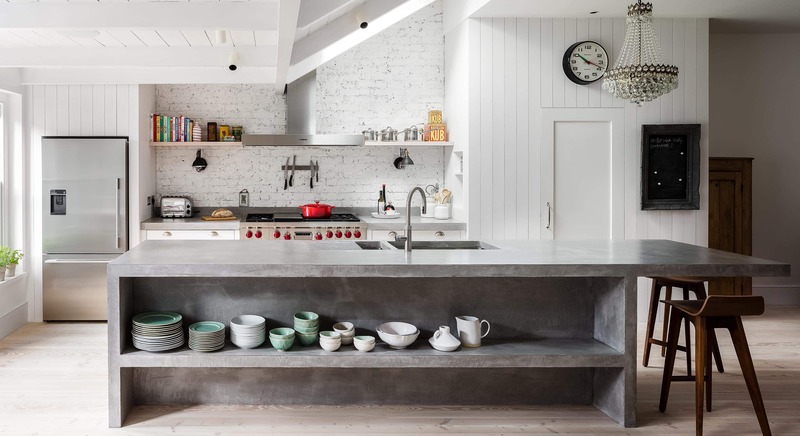 The concrete island creates a strong central feature, whilst adding texture and warmth. 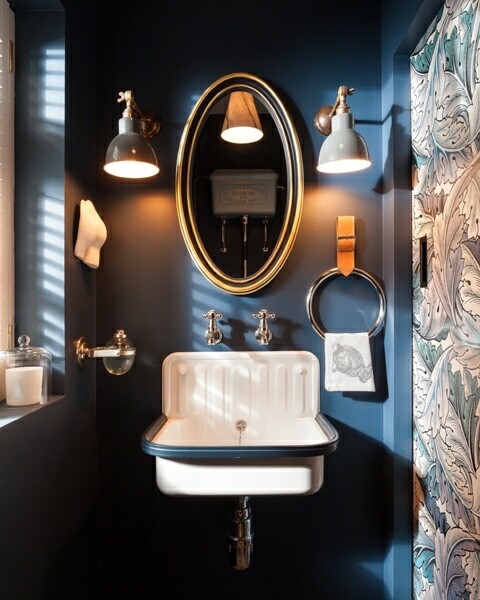 It’s also practical, as the varnished surface is stain proof. 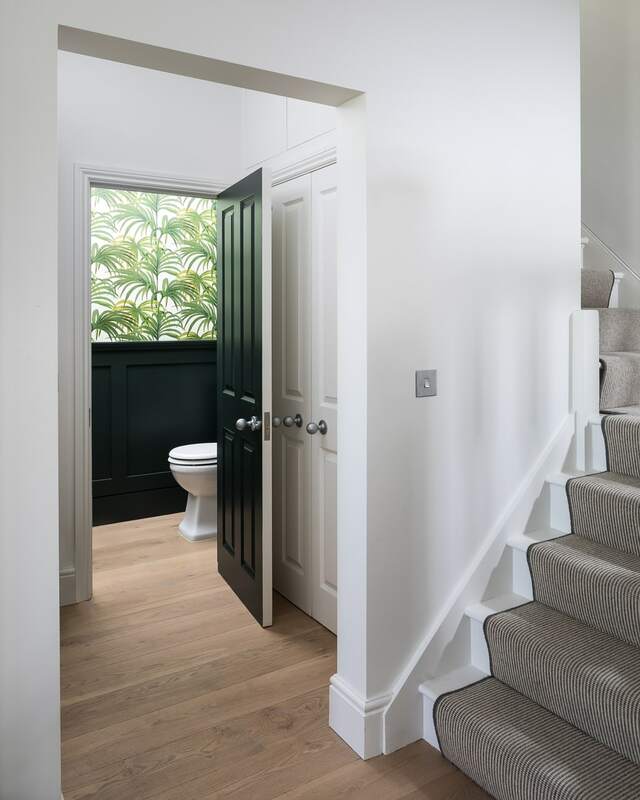 The design of the extension included traditional painted windows and doors which compliment the painted pine board wall cladding and ceiling boards. 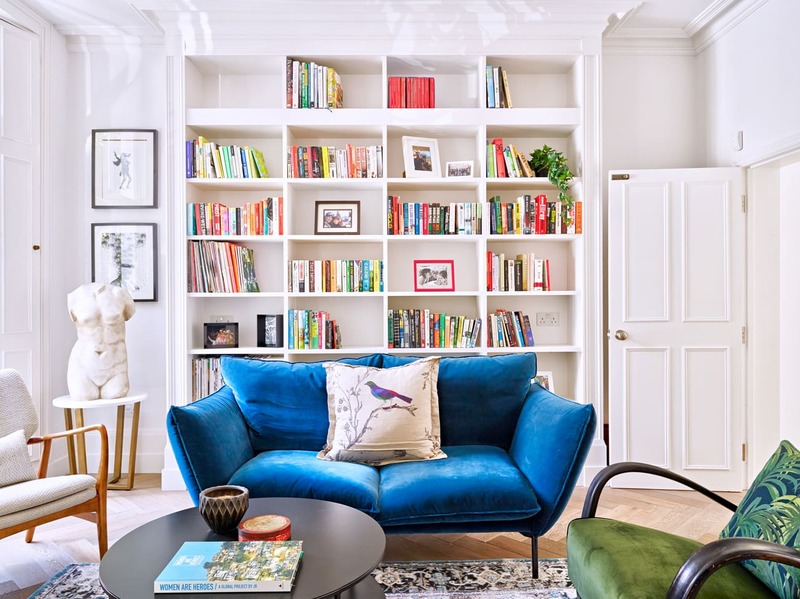 A painted wood bench with cushions extends around the perimeter of the rear elevation and beneath the sash windows creating the perfect setting for a relaxed gathering of friends. 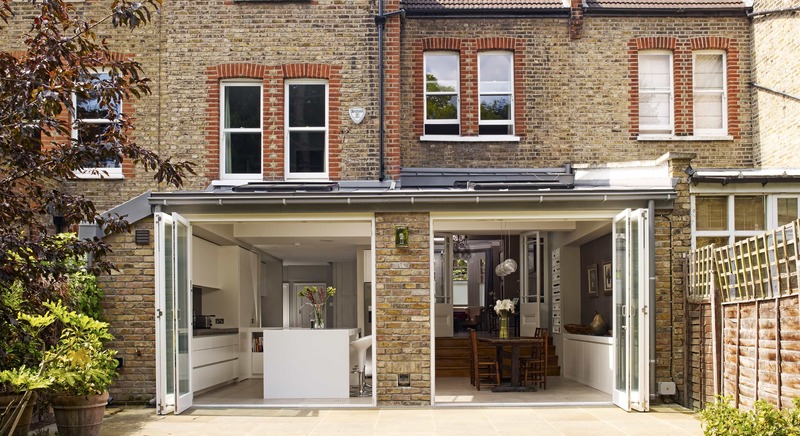 This is an example of the benefits of designing the exterior shell in parallel with the interior. 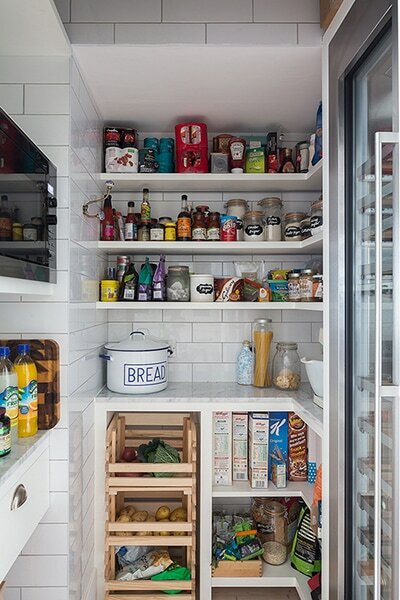 The walk-in pantry is larger on the inside than it appears from the outside. 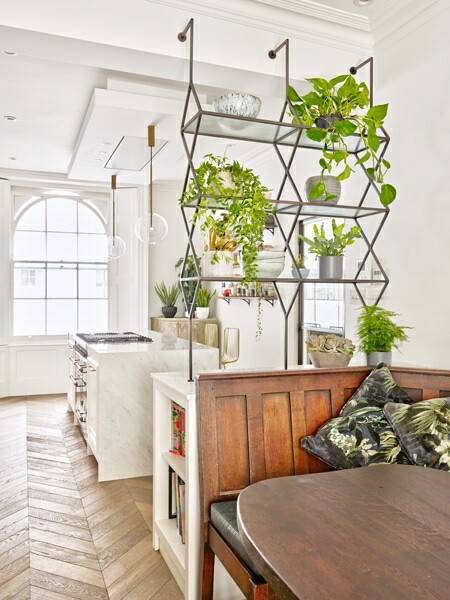 This was achieved by pinching a bit of space from the side alley. 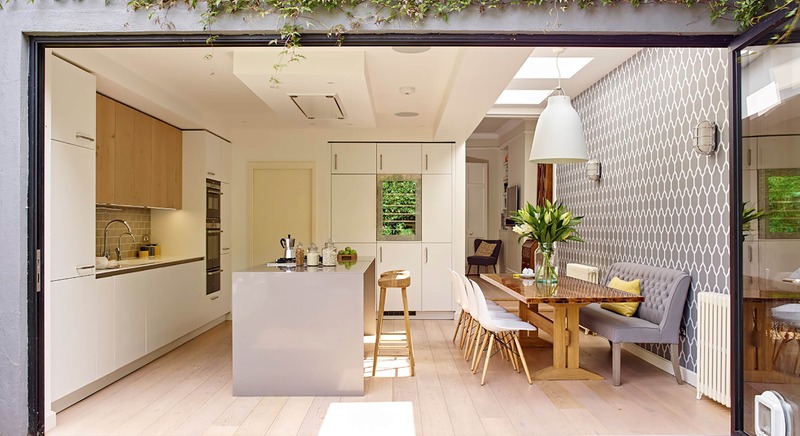 Another demonstration of what can be done if the kitchen design is integrated with the design of the main structure. 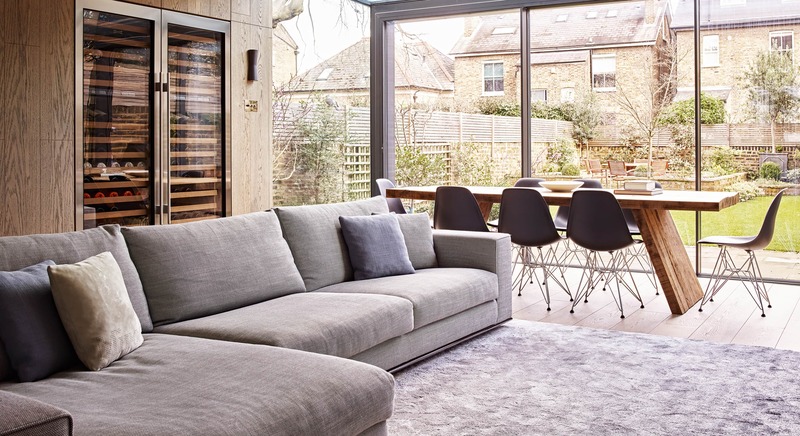 The room is kept cool by natural ventilation and the pantry door has an integrated seal around it to prevent any draught entering the living area. 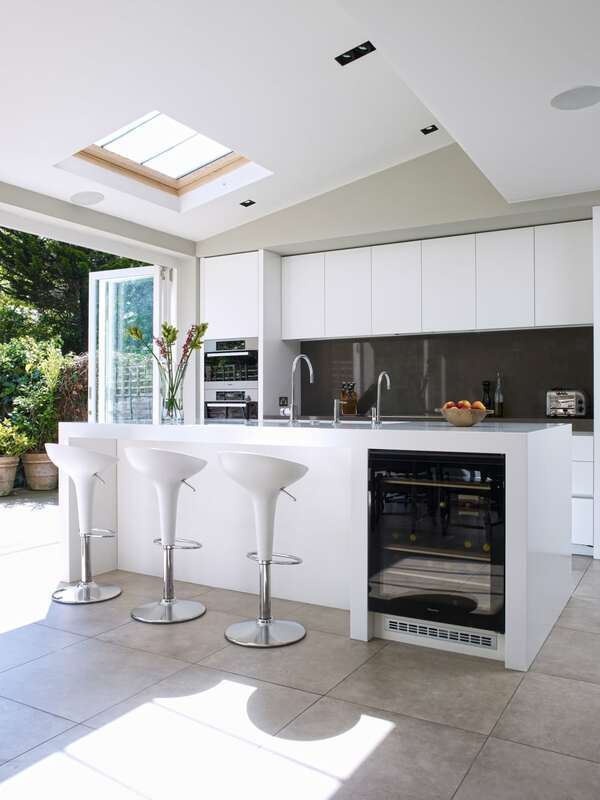 We are often carry out renovations in other parts of the home while work is going on in the kitchen. 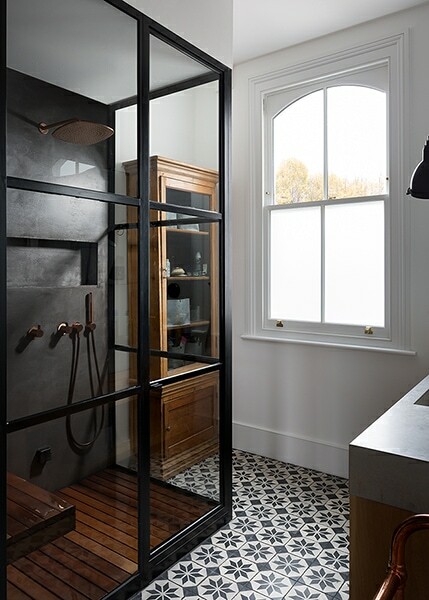 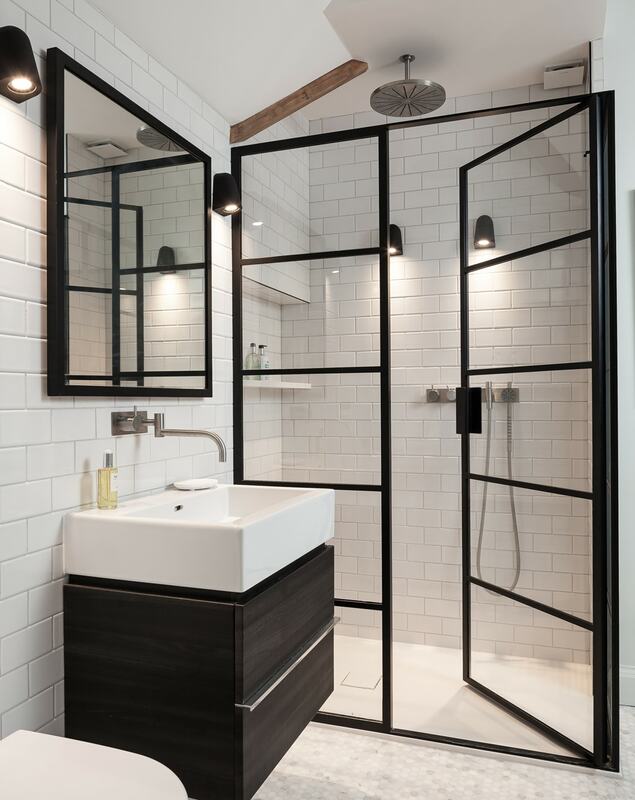 In this home we designed and installed a new steam room with Crittal doors and concrete walls. 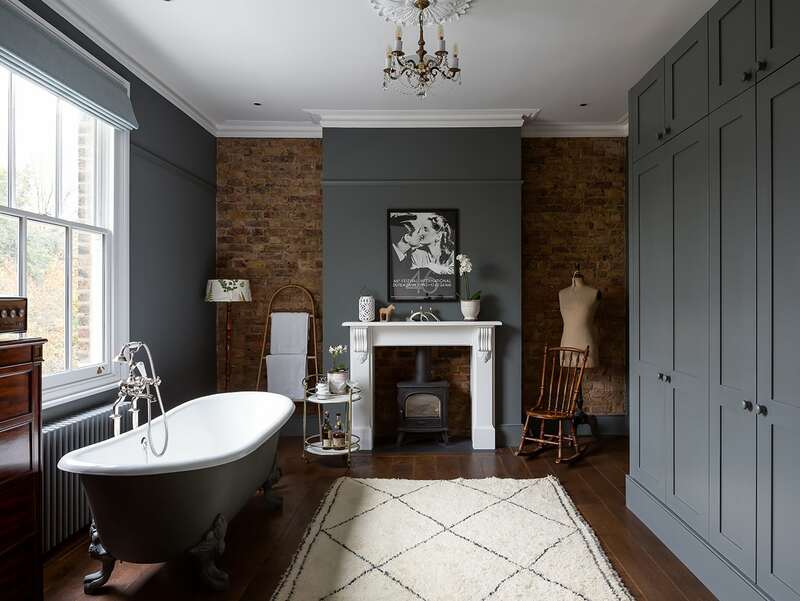 The master dressing room was also renovated to include a freestanding bath and wood burning stove. 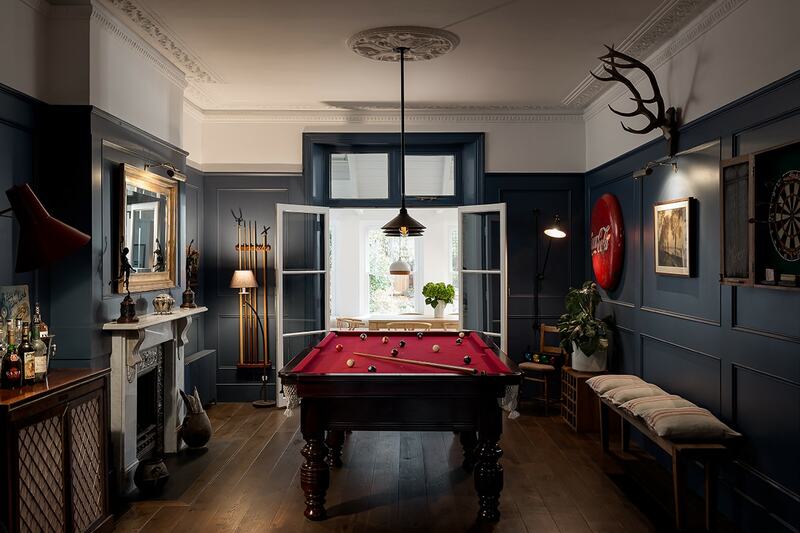 We installed wall panelling, darkened the existing floor, and redecorated to convert the original dining space into a games room. 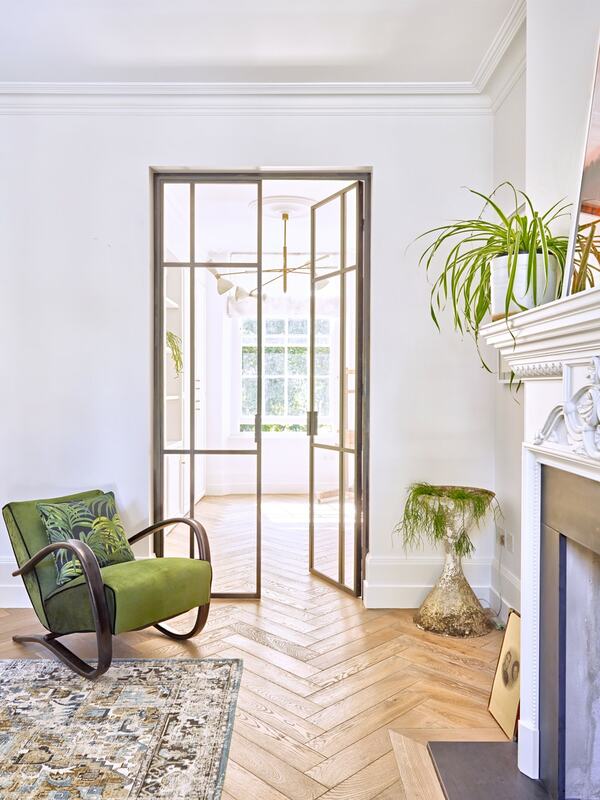 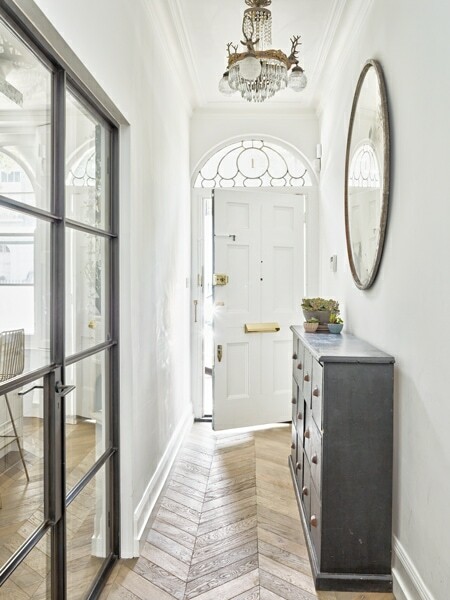 This six bedroom period family home in the Bedford Park Conservation Area, still retains many of it’s original Georgian features in the hallway and front rooms. 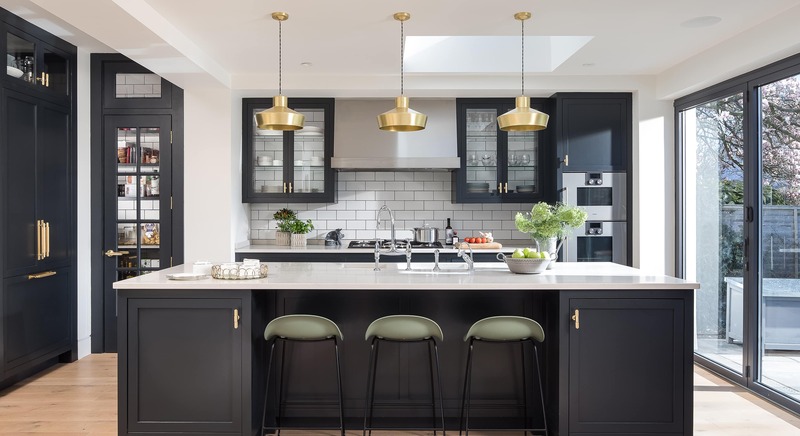 The contemporary style of the kitchen cabinets was consistent with an ‘old vs new’ theme that ran throughout the house. 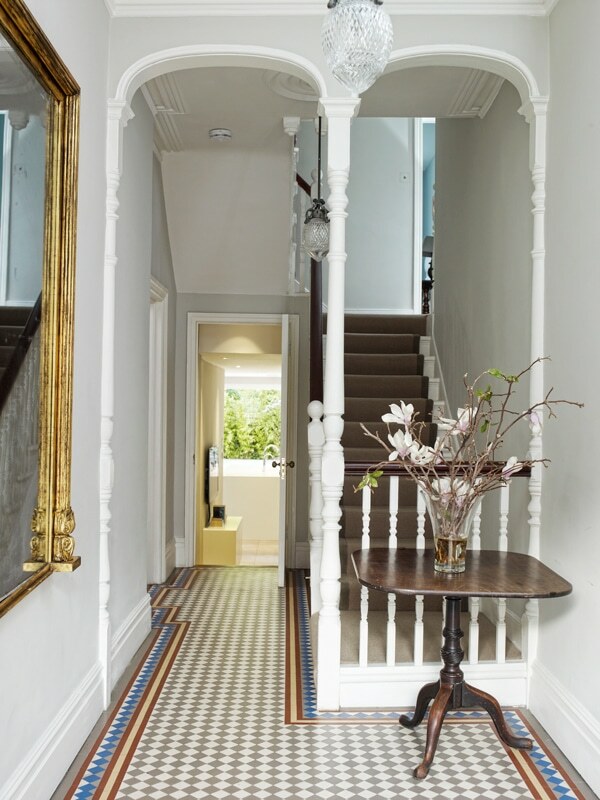 Many of the original decorative features in the main house were restored and redecorated. 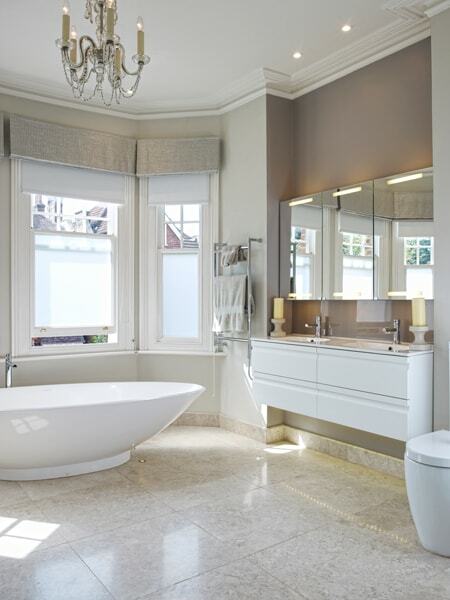 As with many of our kitchen refurbishment projects, bedrooms and bathrooms were renovated. 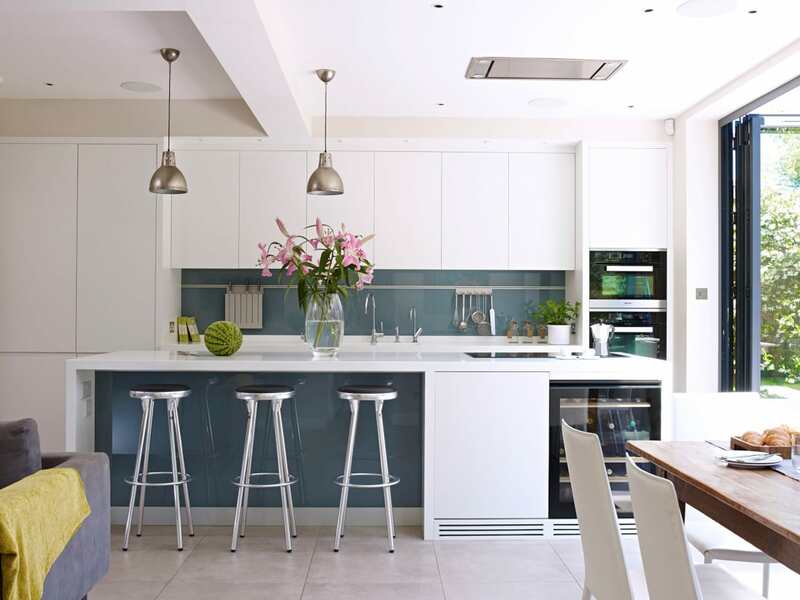 White seamless Corian worktops on the island and handleless lacquered cabinets are juxtaposed with a dining table which has been handed down through many generations. 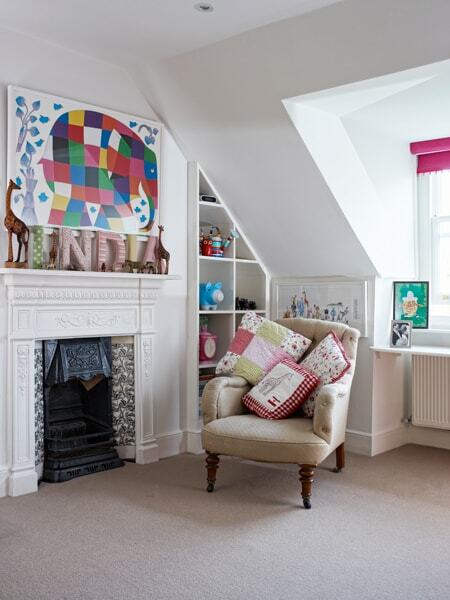 This snug was designed so that kids are seen and not heard while tea is prepared. 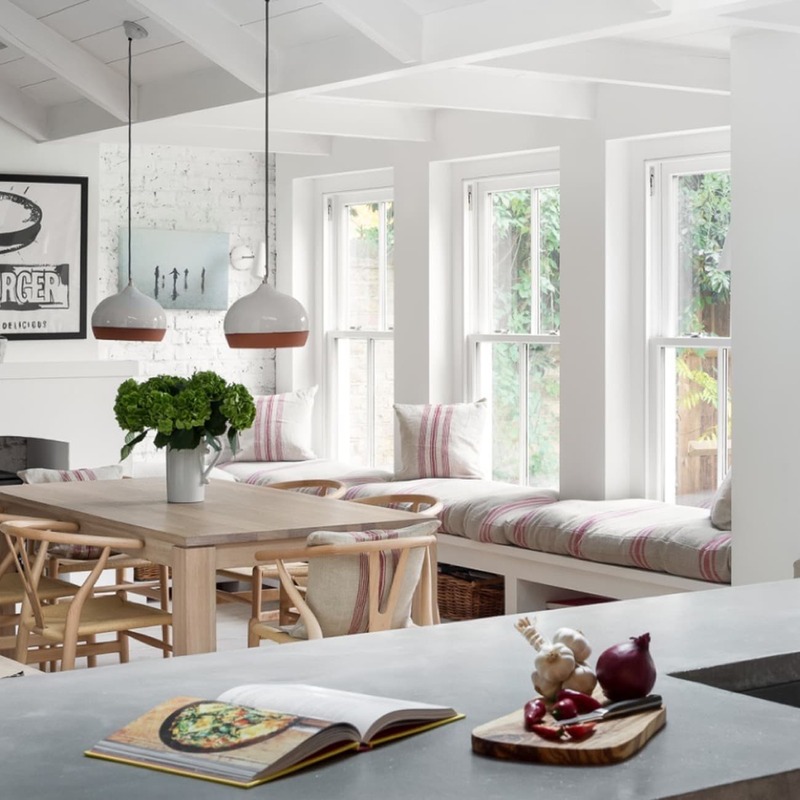 Subtle lighting was used everywhere to highlight the architecture and create warmth. 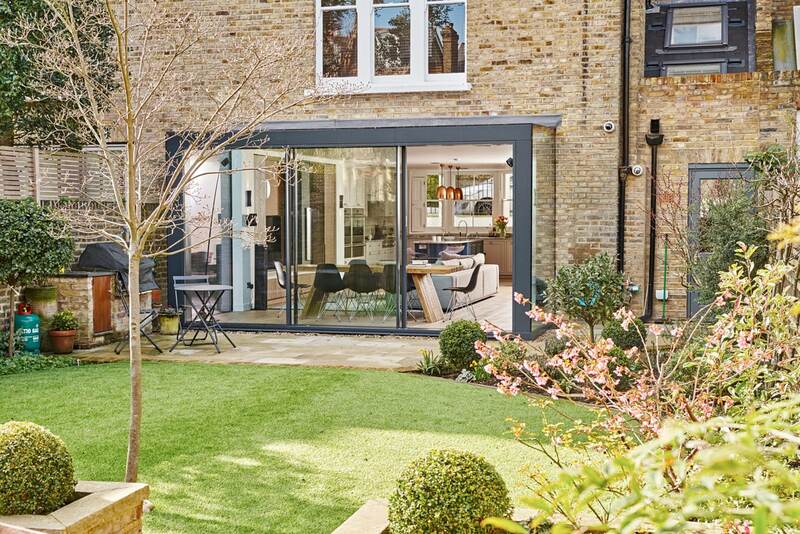 This home in Wimbledon is a building of townscape merit. 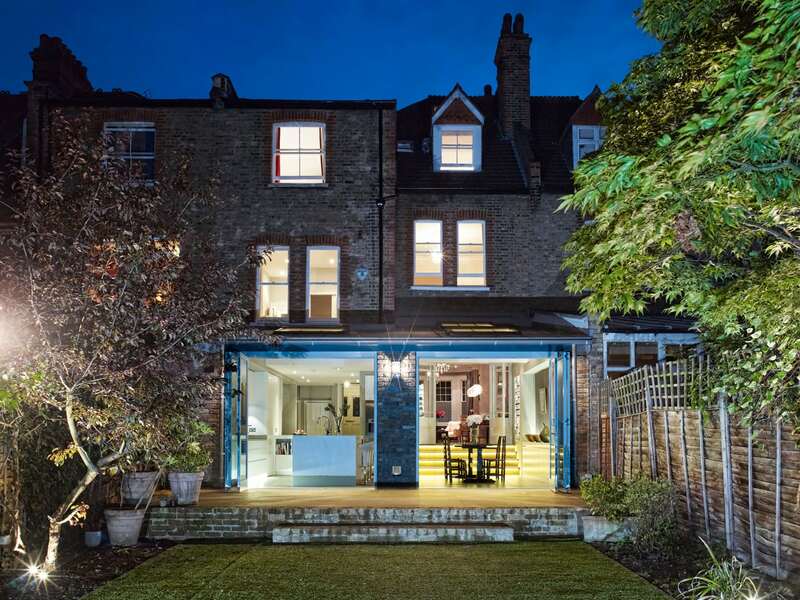 Therefore we obtained pre-application advice prior to submitting our planning application for this side extension. 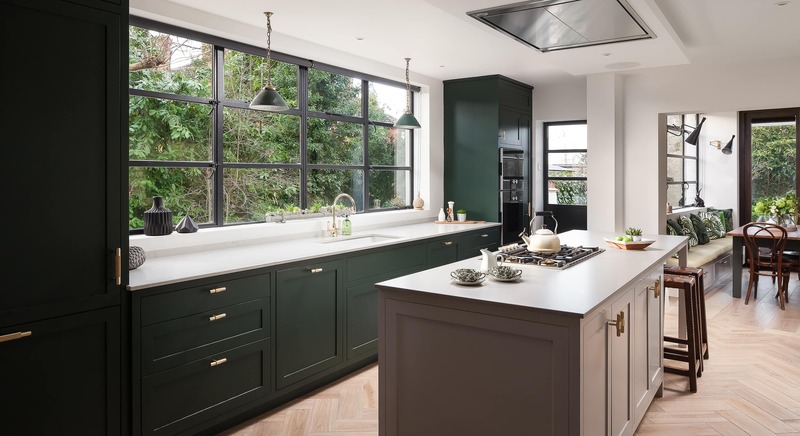 The main kitchen is supported by a practical yet beautiful pantry, with a large butler sink and plenty of additional worktop space for making tea and breakfast. 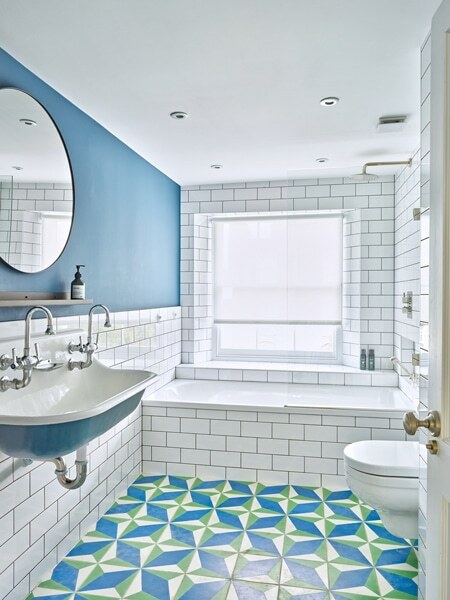 In addition to the kitchen extension, we also renovated the downstairs cloakroom, a family bathroom, the master bathroom and the master bedroom. 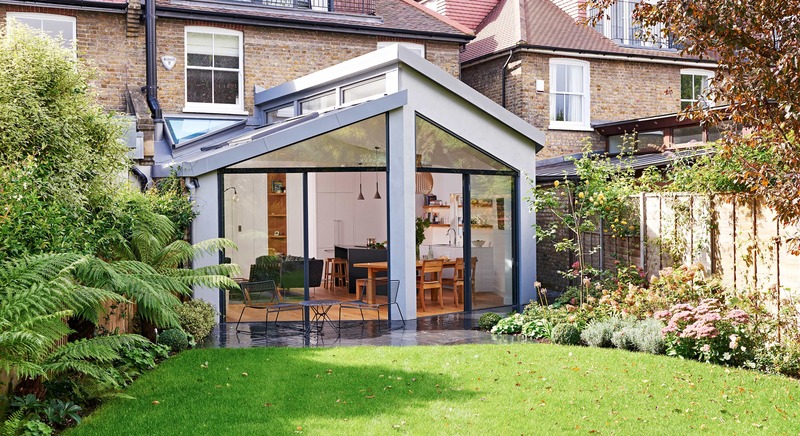 This extension in Wimbledon was designed and built for a family with 3 children who love to play in the garden. 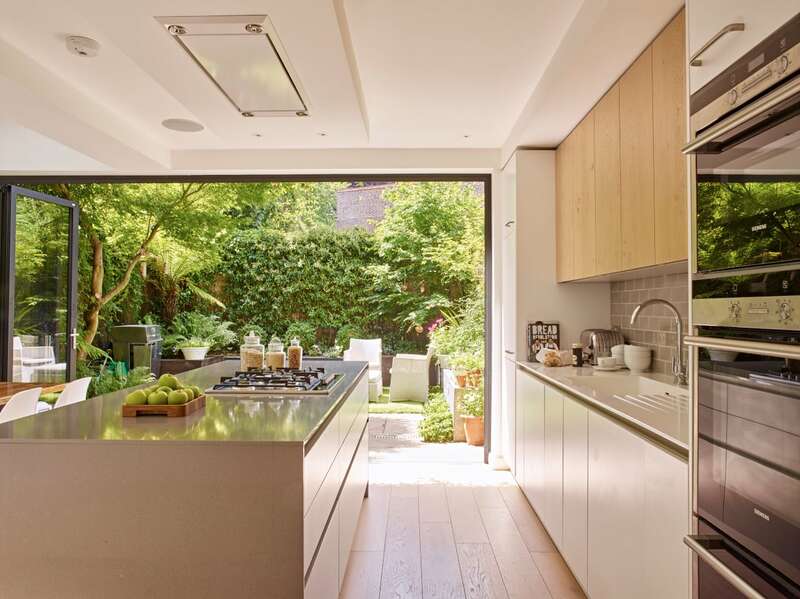 For them, the garden is now an extension of their family room and kitchen. 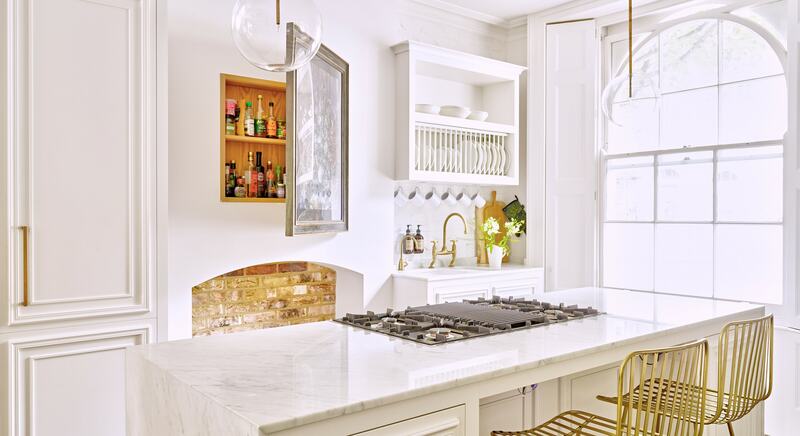 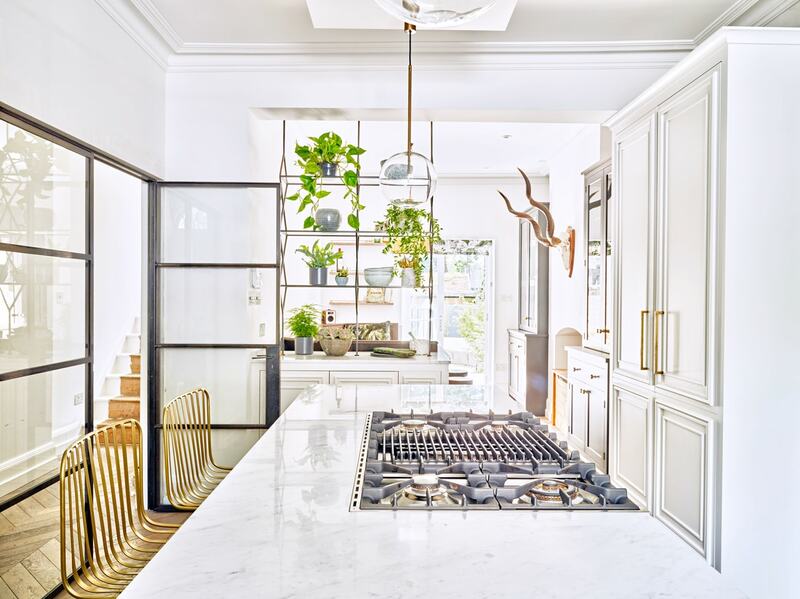 Durability was an important factor when choosing materials for the kitchen. 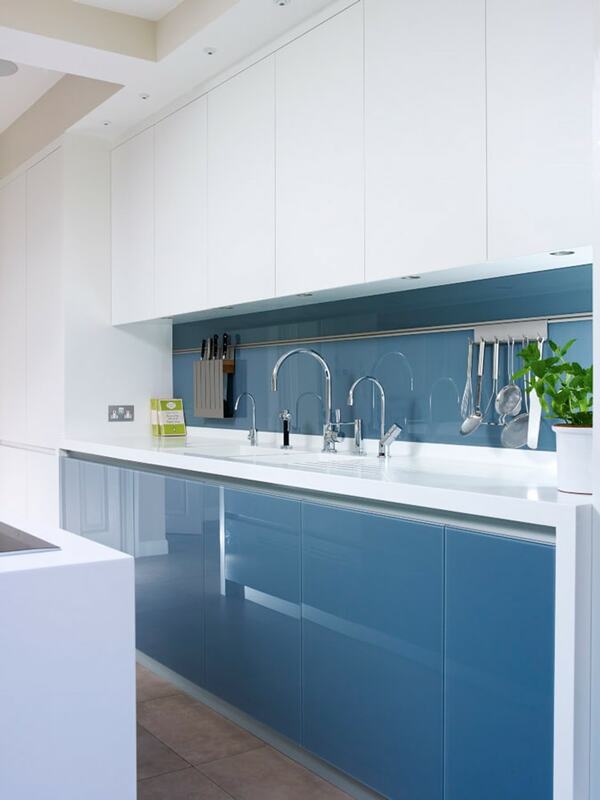 Porcelain floors, Corian worktops, and glass doors are all easy to wipe, strong and stain proof. 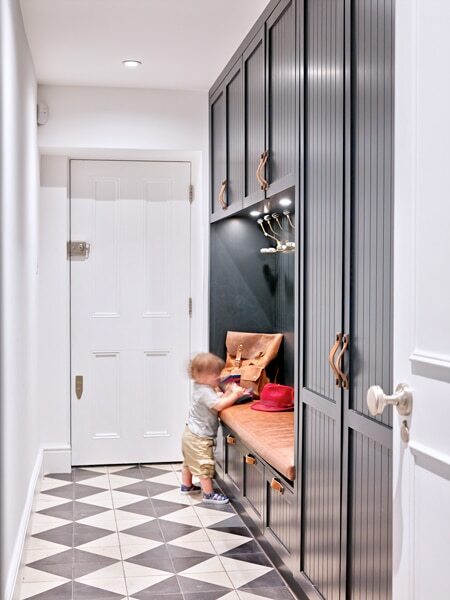 We love to include space for a walk-in pantry within our kitchen designs. 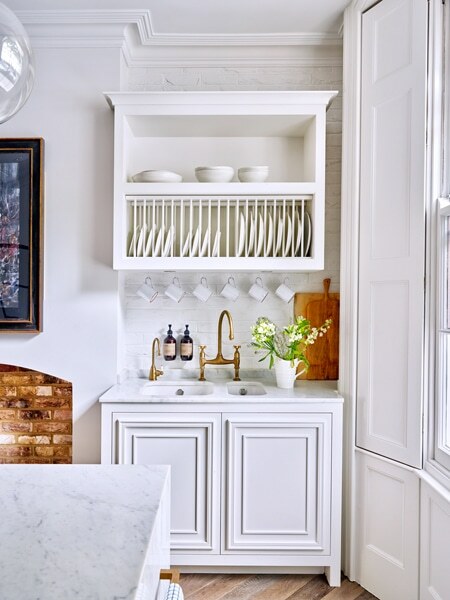 They usually work out less expensive than kitchen cabinets and they provide a storage capacity that can’t be matched in a kitchen. 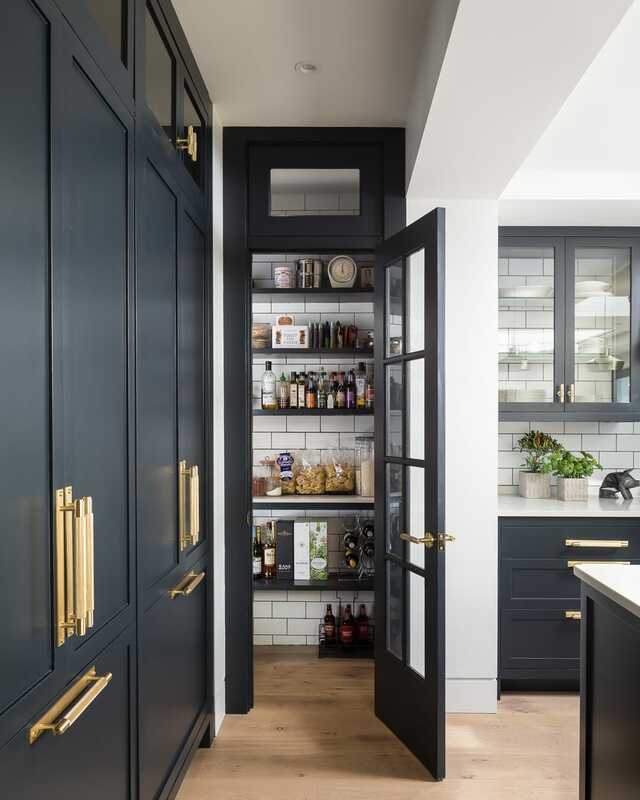 This family were lucky enough to have space for a walk-in pantry, as well as a larder cupboard with enough worktop space for a coffee machine and a kettle. 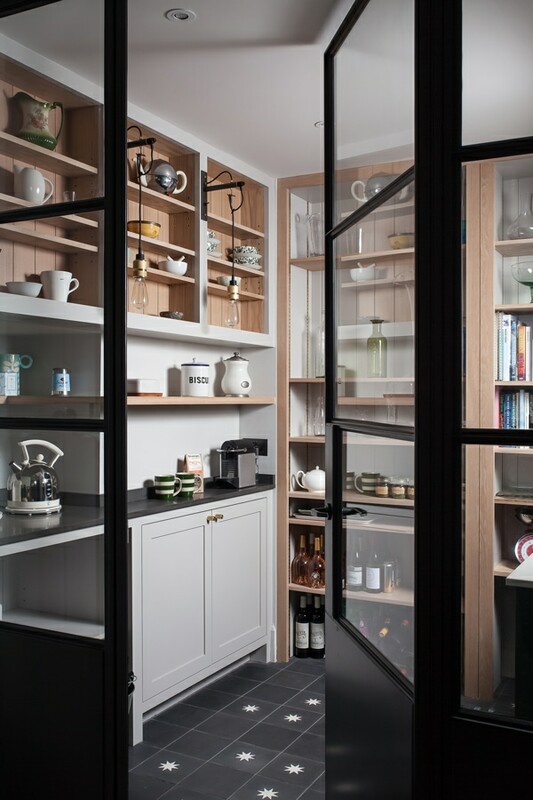 Adjacent to the larder cupboard is a large integrated fridge and freezer manufactured to match the pantry cupboard. 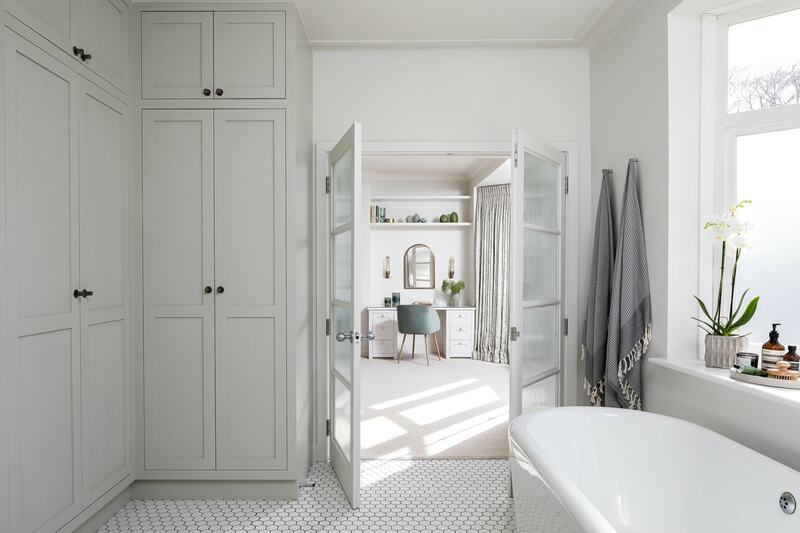 In addition to the kitchen, we also renovated the downstairs cloakroom, the utility room, the entrance hall, the master dressing room and the master bathroom. 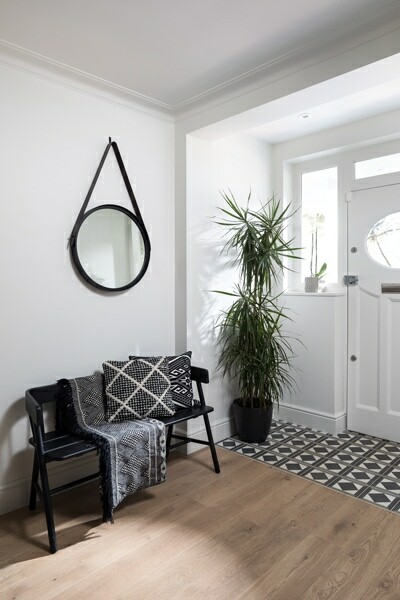 This is a typical 3 bedroom terrace house in the heart of East Sheen. 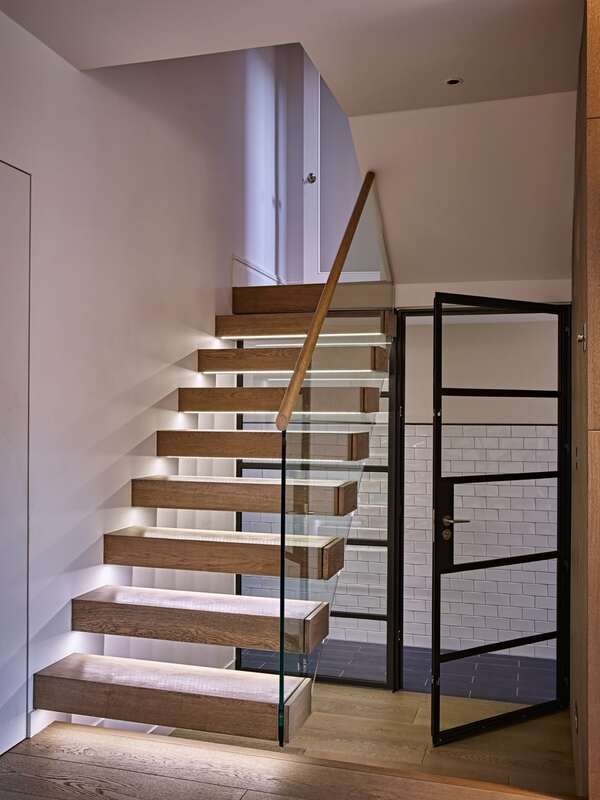 These projects typically require 3 months to plan (assuming planning permission is required), 3 months to build and 1 month to fit out. 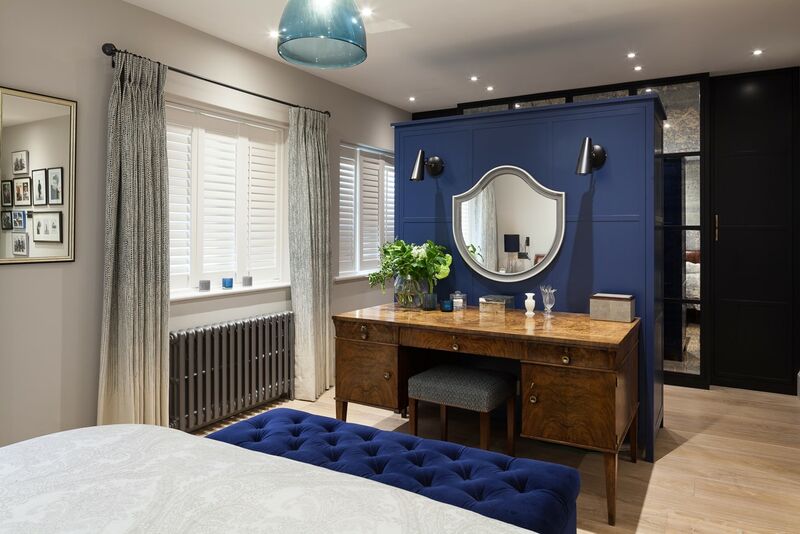 Our design team will recommend flooring, lighting, heating, wall finishes, and furniture in order to get the room finished and furnished.